Are you a hero, or merely a toothless charlatan? You better hope to be a hero, because the king has summoned all those claiming to be heroes, and that includes you, and done the only thing that makes sense in order to separate the real heroes from bogus lowlifes. That is, he has tossed you and a few others into a dungeon with only one purpose: fight your way out alive. If you survive, you will prove yourself a true hero. Fail, and… well, the kingdom can always use a little more fertilizer. It will be no easy task, as it will require great skill and a bit of luck. And a bit of silliness. In Dungeon Fighter, players take on the roles of would-be heroes who have been tossed into a deadly dungeon to prove their validity, and the only way to escape is to make their way through the twisting passages defeating monsters and ultimately facing off against the final boss. If they make it that far, which they probably won’t. Exploring the dungeon is a simple task; usually, you simply move forward to the next room. Occasionally you have a choice of two or three paths you can take; some are easier, some are not so easy but offer greater reward, and some are downright difficult but also rather tempting with their bounteous prizes. 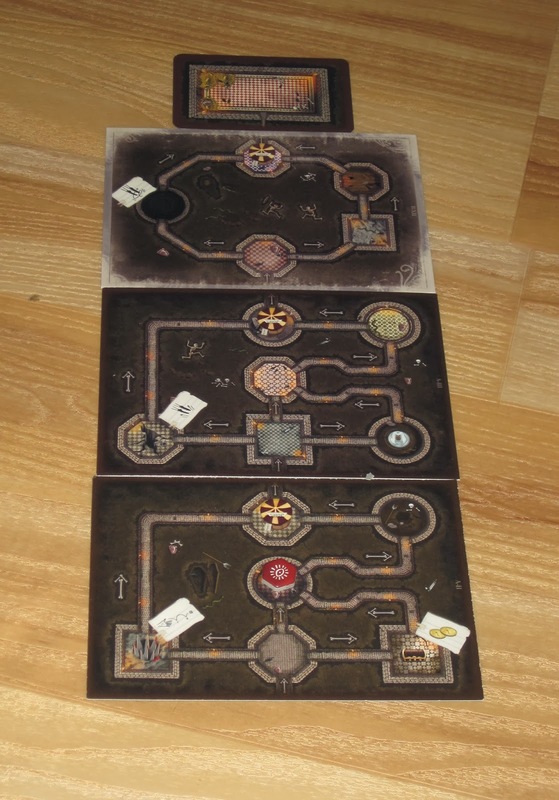 The dungeon map. This is made randomly each game, and each map offers different rewards and challenges. In each room, players must face off against a single monster. And that is the difficult part. Players attack monsters by tossing dice onto a target-shaped board. Not rolling dice, tossing dice. What you roll on the die hardly matters (actually, the dice are mostly blank-sided with a few sides engraved with an icon shaped like an eye), but where you land is important. The closer you land your die to the center of the target, the more damage you score against the monster. Miss, and the monster attacks back. The simple restriction on die-tossing is that the die must hit the table at least once before landing on the target or the throw counts as a miss. If you deal enough damage to reduce a monster to 0 hit points, you defeat that monster, earn some treasure, and move along. The target board is a harsh mistress. Of course, there are many roads to failure. As I mentioned, miss a toss and you take damage. If your party doesn’t kill the monster before the three colorful dice are used up, you have a choice–the entire party can take damage from the monster to get the three colored dice back or you can use white dice, which have the problem that they are one-time use. You can always purchase more later at the shop, but that gold is hard-earned and useful for items, weapons, armor, and healing. If all the heroes get killed, the game ends in a loss. If one player gets killed and the rest of the party finishes the monster off, that player will get revived, albeit with a chunk of hit points sliced off their maximum and the loss of a special ability. 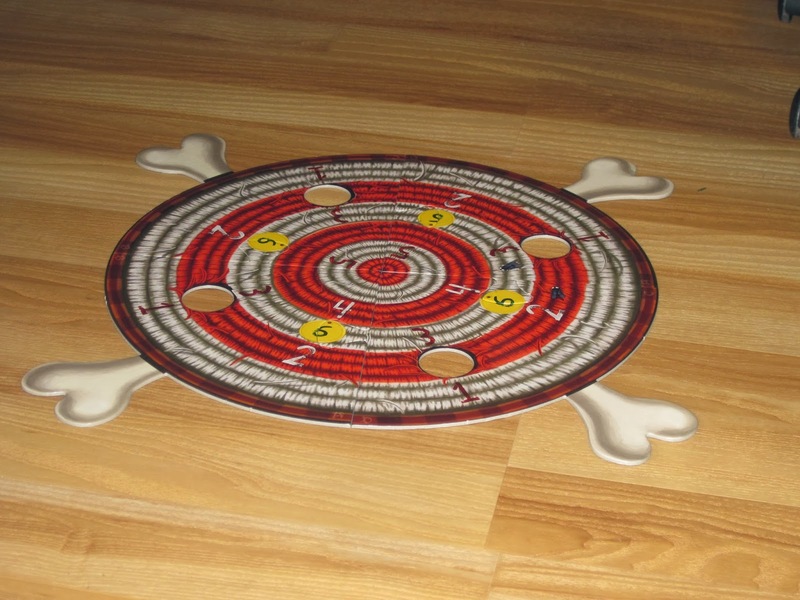 Each player has a character with a set of three special abilities that are triggered if the die toss lands with the eye icon facing up. Some abilities trigger even if you miss! Some of the monsters in Dungeon Fighter. Speaking of special abilities, dice tossing isn’t always straightforward. Depending on the monster you are fighting, the room you are in, and the weapon you are using, you may have certain… requirements you must follow. For example, you may have to close your eyes. You may have to sit under the table and make your toss. 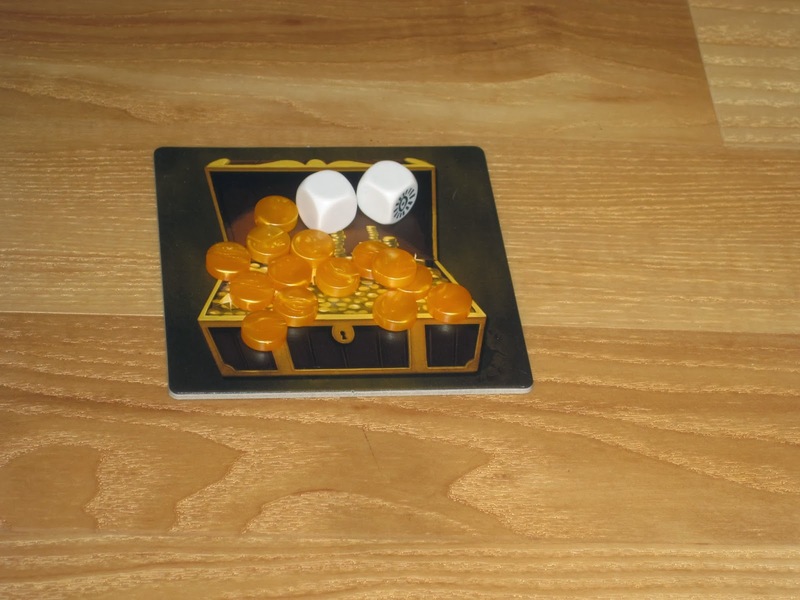 You may need to roll the die down your forearm, or use another player’s hand to throw the die. You may have to toss it underneath your leg. You may have to jump in the air, spin 180 degrees, and toss the die before you land. In the right (or perhaps wrong?) circumstances, you may need to roll the die down your forearm with your eyes closed while jumping in the air. Good luck to you. Players win if they manage to defeat the final boss. Ha ha. The final bosses are TOUGH…if you manage to make it this far. 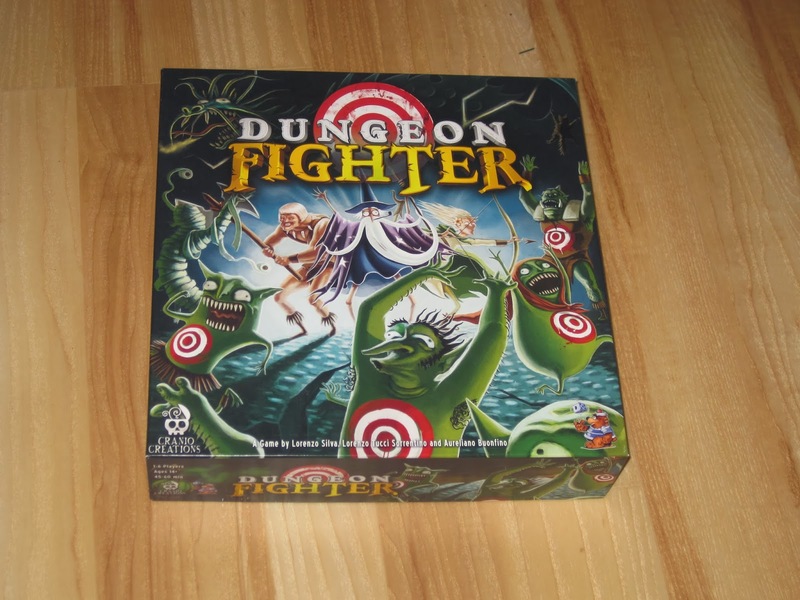 When I first heard about Dungeon Fighter, it seemed like a fantastic concept. Fighting monsters? Tossing dice? Silliness? What a trifecta! How could any combination of those things result in something other than fun? I can’t say that I know the answer to that question because Dungeon Fighter is, plain and simple, a fun game. One of the game-i-est games I’ve ever played. There is only a very small amount of strategy involved. Most choices are simple and tactical (do I use the blue die or the red die? ), although there is some strategy in the weapons you choose to (attempt to) use. But this game isn’t about choice. It’s about fun. The three hero dice and the generic dice. The eye icon triggers a special ability. This game takes everything that is fun about rolling dice (you know, the part where you actually roll them, the very satisfying “thunk” as they hit the table…) and amps it up to the next level. While rolling the “critical” eye is always useful, it’s far more important to just land your die on the target, a skill-based endeavor that brings the skill down to ground level. I’m sure that someone could spend hours practicing and become impressively savvy with the die toss. 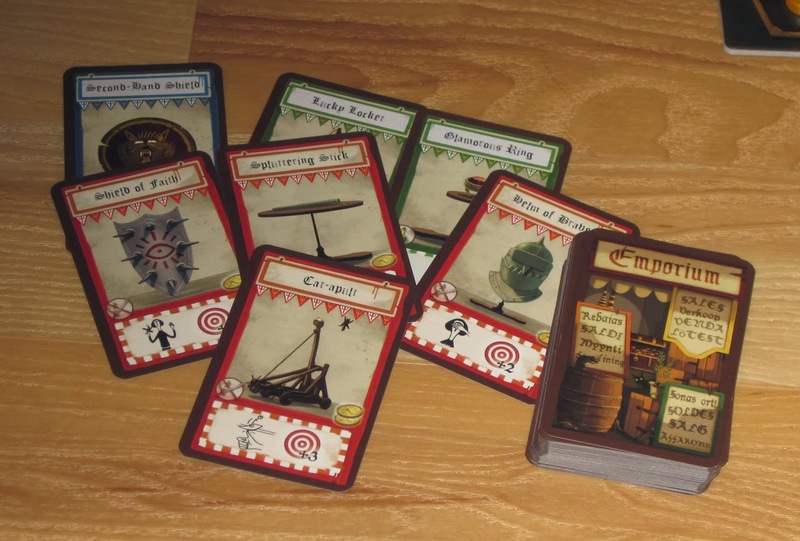 But for those of us who prefer playing board games, the skill required is pretty leveling. Anyone can miss, but more importantly, anyone can score a hit. Add that to all the ridiculous ways you are forced to try and toss the dice, and you’ve got a pretty level playing field. Someone with more skill might be more eager to try ridiculous shots. Then again, someone with not much skill might get just as lucky with a ludicrous attempt with a combination of effects than as with a simple, straightforward toss. Weapons and items offer huge rewards if you take (and make) a trick shot. The point is, it’s fun either way. It’s fun to toss the dice, even if you miss. We lose this game far more often than we win (have we ever won? it’s been close), but it creates memorable moments. I distinctly remember the time we tried to vanquish the crazy cat lady, but she just kept regenerating, and it was too much. I will never forget the moment we were 2 hit points away from defeating Dungeon the Dragon, a final boss, with one die toss left. It was a simple, straightforward toss, one I’d made a dozen times before… and I missed by two inches! CURSES! The point is, the game is fun. Pure and simple. It’s a great party game (as long as your party isn’t too large) because it’s so silly and you can cheer each other on. It’s great with as few as three people, since you get more opportunity to toss the dice (but you still want some people there to witness your amazing skills. Yeah, skills. Right?) It’s a great game-night closer or opener. It’s not deep enough to scratch the thinking game itch, and it’s not a deep strategic experience. It’s just about tossing some dice. The only real problem I’ve experienced in this game is that some of the requirements don’t combine well, or at least, it’s hard to figure out how they combine. Especially the “praying” pose, which requires that you place the die between your palms. That gets tricky when you also have to roll the die down your arm or flick it off the back of your hand. Fortunately, the game is not-so-serious, and I’m sure your group can figure out the required movement per your preference. There is also a rule for making changes if it seems a certain skill shot would be absolutely impossible to pull off. Details about the potential trick shots in the game. Some of them do not combine very well, and all of them are tough in their own way. What more can I say? If you like fun, you’ll probably like Dungeon Fighter. That’s what it is. Dungeon Fighter is a blast. And when I think about why, it doesn’t add up, at least for me. I’m not attracted to dungeon crawler games. I usually like my games with a heavy dose of strategy, or at least a clever decision. Silly games like Munchkin or Red Dragon Inn are usually fun once or a few times, but they’re not games I enjoy returning to over and over again. And I have mixed feelings about co-op games. Then again, I like dexterity games. 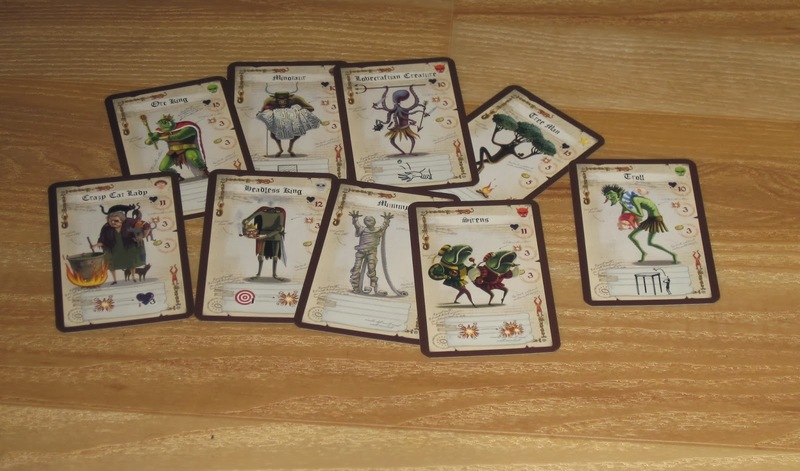 And Dungeon Fighter, at its heart, is a dexterity game. A silly, stupid dexterity game that’s hilarious to play. I think what makes Dungeon Fighter work, oddly enough, is that it’s cooperative. I’m usually not keen on playing cooperative games at game night (let’s get competitive! though as uncombatively as possible, please #Eurogamer), but Dungeon Fighter gets a pass because it is nigh impossible to win (at least given my group’s skill level). The overwhelming nature of the task combined with its low stakes (the world isn’t overrun with disease if you lose) creates a loose, silly, playful environment where cheers and pointing fingers are welcomed and encouraged. The characters in the game. 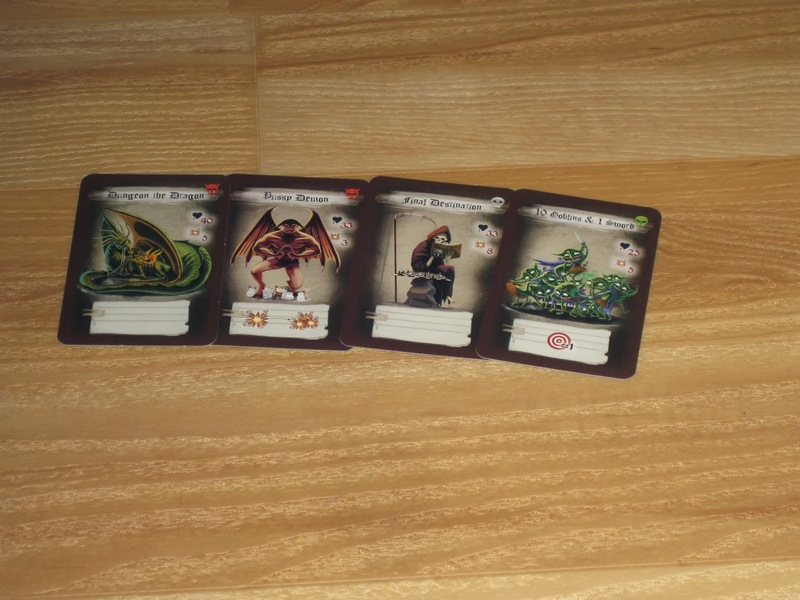 Each character has three special abilities, each tied to one of the colored hero dice. In addition, each hero can hold three things–items, armor, or weapons. The silliness of the game is borne out in just about everything about it. 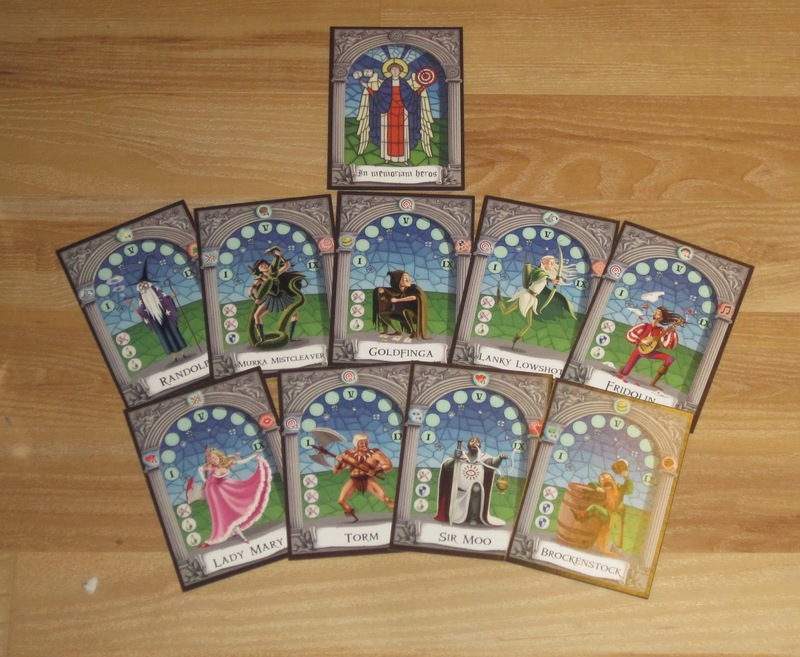 The hero cards depict inept adventurers with appropriate names (Randolph the wizard, for example). The art is lighthearted. The monsters in the game are great (e.g., the crazy cat lady), as are the weapons (e.g., the cat-apult–yes, there are lots of cats in the game). The trick shots required are sometimes impossible but always fun to watch. And the cooperative nature of the game makes players invested: you desperately want your teammates to make the shots they need to, and you can be duly impressed when they succeed because it benefits you. There are collective groans when you have to dance while throwing under your leg, or throw from beneath the table with your eyes closed. There are cheers when, magically, you somehow land your die on the target board. If you haven’t gotten this yet, Dungeon Fighter is an experience game. There are some tactics, but they’re secondary. Really, you just throw the dice and hope they land where they need to. There’s not any significant strategy. The team rises or falls on the skills of the players, and the point of the game is to give players a story to tell once the game is finished. Yet for all this, I wouldn’t call it a “party” game. There is some setup, and there are rules, and these rules take some time to explain. It’s not an ideal game for every group, and I probably wouldn’t want to play with more than four players (since you wouldn’t get as many turns, although watching others throw the dice is almost as fun as tossing them yourself). 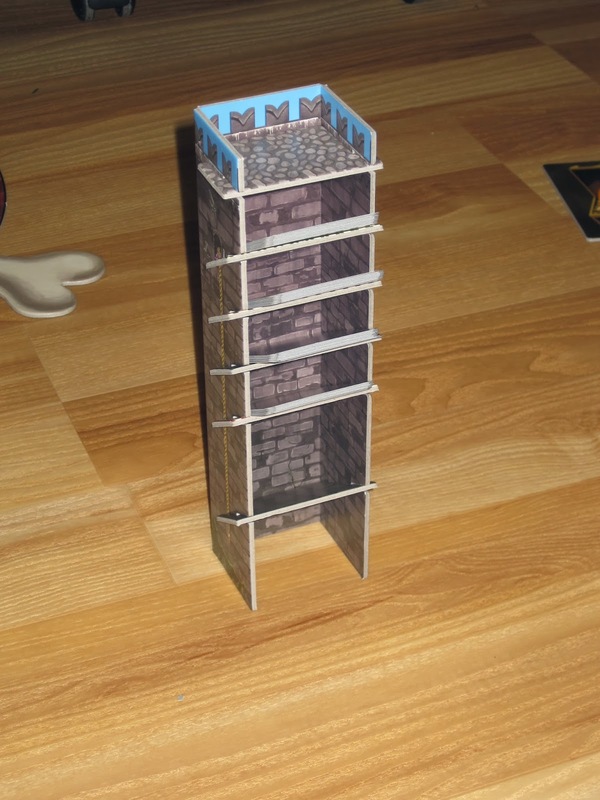 This tower (to hold the monster cards) is completely superfluous…It’s also really cool. A word on the components. 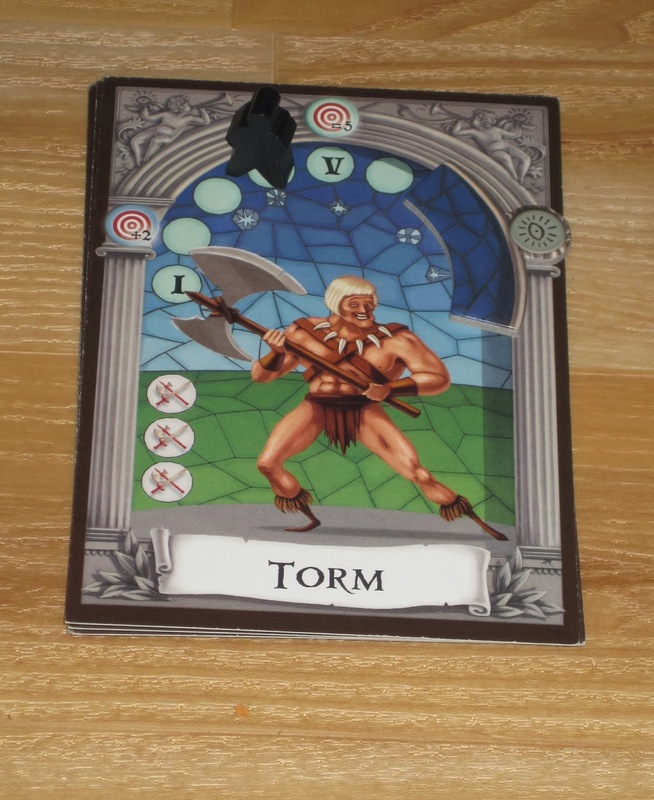 The dice are very nice, and all of the cards and cardboard in the game are high quality. 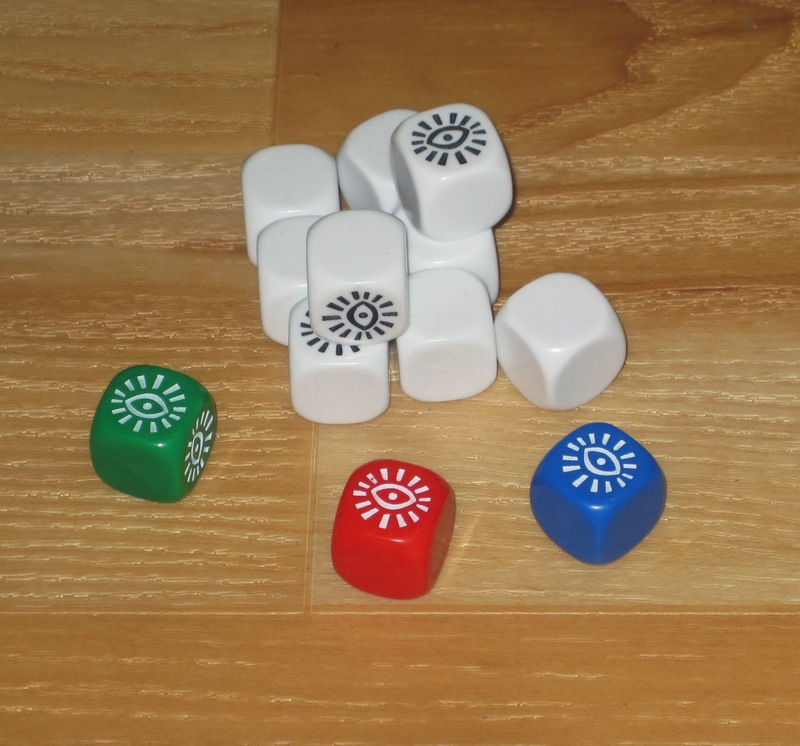 The dice have rounded edges and should work well on most play surfaces. (And you can account for the differences in material from table to table as “terrain.”) The target board is cool, and this game has a table presence. I played for the first time at Gen Con this year, and we had lots of people stopping by to watch (which, given our skill level, was a little embarrassing). It’s that kind of game for good or ill. The one place where the components fall a little short is the rulebook. 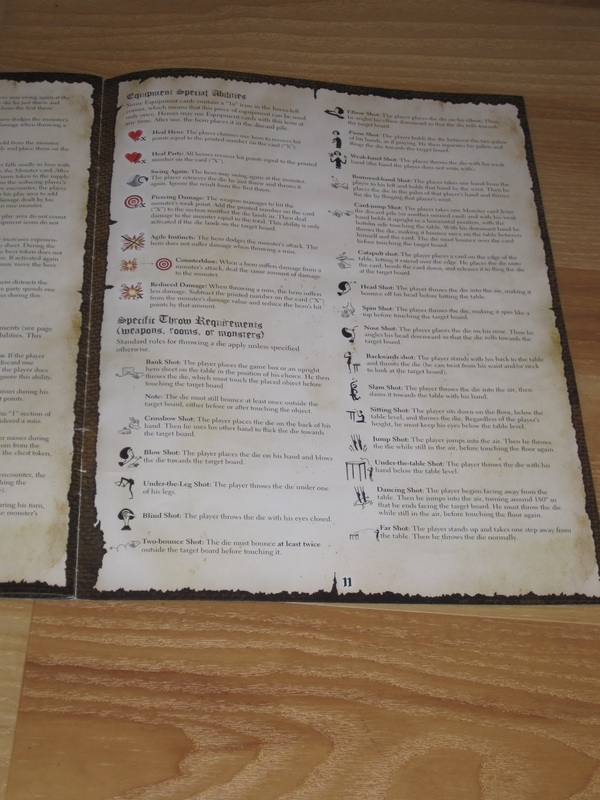 The rulebook isn’t organized very well, and there are several ambiguous cases (as Wolfie mentioned above, though there are more than just wondering how dice throwing techniques combine). For a game that’s not meant to be taken seriously, the rules are harder to parse than I would like, though the task is not impossible and the gameplay is worth it. And since players aren’t meant to take themselves too seriously, a little house ruling here and there and you’re back to throwing dice in no time. If a player dies, she or he comes back again, but with a scar permanently reducing hit points and covering one of the hero’s special abilities. Dungeon Fighter is hard, even on its easiest setting. But it’s meant to be (which is why the rules provide for scaling the difficulty if your group gets better–mine hasn’t, so we still play on easy mode). If the task weren’t so impossible, there wouldn’t be room for the raucous celebrations that happen when, after thirteen shots at the target’s bone, you finally land a hit on the outer circle. Dungeon Fighter won’t be for everyone. I’m even surprised I like it as much as I do. But if you’re looking for a fun and stupid game to play with your buddies, Dungeon Fighter might be it. It’s fun to throw dice at a target board, and it’s fun to embark on a fool’s errand with your friends. It’s fun to watch your friends take stupid trick shots, and it’s fun to attempt them yourself. Oh, and it’s Wolfie’s fault we lost against Dungeon the Dragon. His last shot was shameful. Serious players need not apply. Shameful Wolfie haha! I had a blast playing this game with our friends. I made the bad (good?) choice to play on the normal difficulty… While it was a crippling death on the second floor we had a blast with all the wacky ways to toss the die. Thanks for the review you guys! The good news is, in another game I made up for my miss by hitting the kill shot in the bullseye for the final boss, so, I’d like to think I am redeemed in that manner.